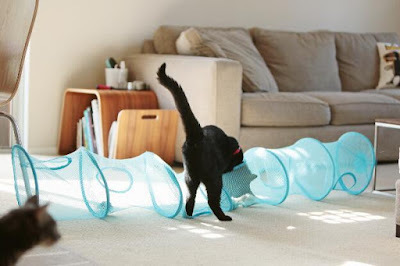 Living with cats offers a special set of home decor dilemmas, we are always want to provide a comfortable for our furry friends, but the idea of giant cat towers taking up floor space in living room.Fortunately, there are 15 IKEA hacks DIY your cat will love, Whether you're trying to hide an unsightly litter box or just create a kitty house that isn't totally ugly (and doesn't cost a billion dollars), there's something here for you in this roundup of clever cat-centric IKEA hacks.Hope you and your cat will love it, and let us get to DIY it ! Enjoy ! Overlap and secure 3 tables of 4, using brackets chair and screws. Use the 4th tray table to make the base of the tree. 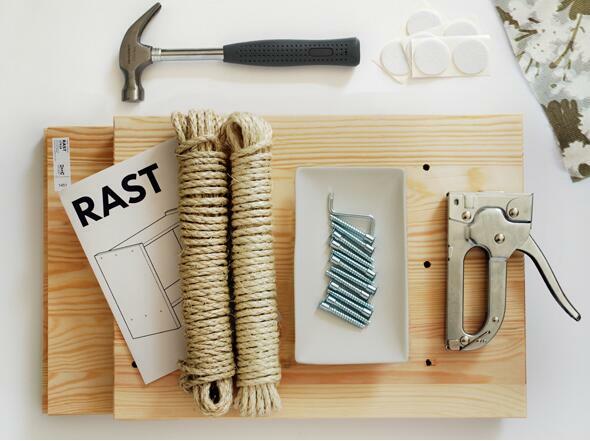 After that, wrap the Sisal twine around the feet of the table. You can attach it with glue, tacks or just as I did: making nodes (easier in case you want to remove and replace it). I use the mat bathroom to make the tree more comfortable. I cut it in half, I put the bias with my sewing machine so that it doesn’t fray. 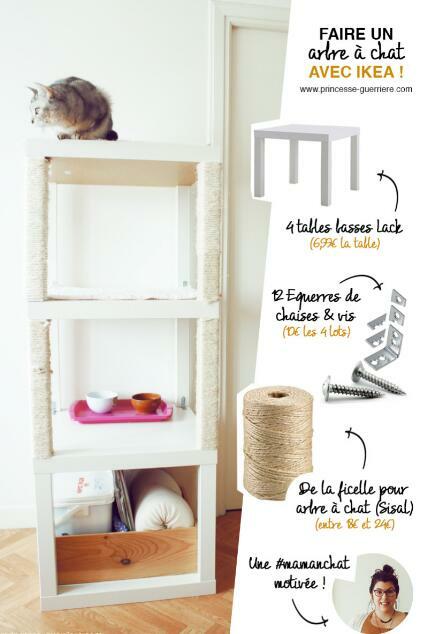 You need :FAKTUM Wall cabinet, Applåd white door, BESTÅ Push opener, litter box, cat flap, self adhesive vinyl roll. 1. We assembled the FAKTUM frame and used a jigsaw to cut out the access hole for the cat flap, following the template included with the cat flap. 2. The FAKTUM frame has holes on the top and bottom shelf, and since we positioned the cabinet on its side, these were clearly visible and ugly. My husband covered both sides with white self adhesive vinyl, and he also used it to cover the inside of the cabinet, so that litter wouldn’t fall in the holes. 3. We fixed a BESTA push opener to the cabinet, to make opening the door easier. We also screwed a hook to leave the litter scoop in the kitty loo. 4. 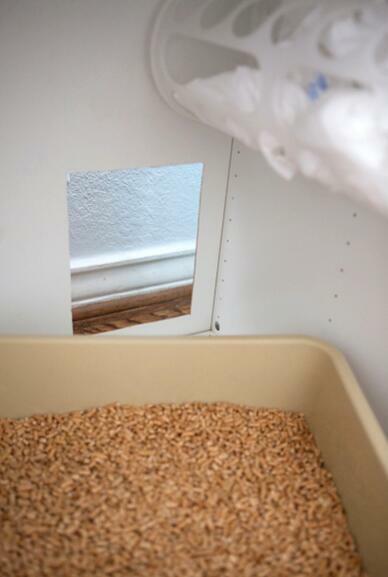 We bought a narrow litter box, and placed a plastic ribbed mat between the litter tray and the cat flap, to avoid spillage of litter on the floor. We also put some bicarbonate of soda in a small container inside the cabinet, to help absorb nasty smells. 6. Access to clean the box is easy by simply opening the cabinet door. 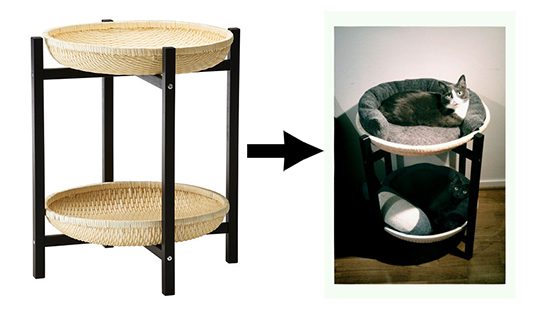 Basket Bed: Pick up an IKEA woven basket, screw it into the wall and add a cushion for a stylish piece of kitty wall art. or you can just put on the grand, you cat will love it ! 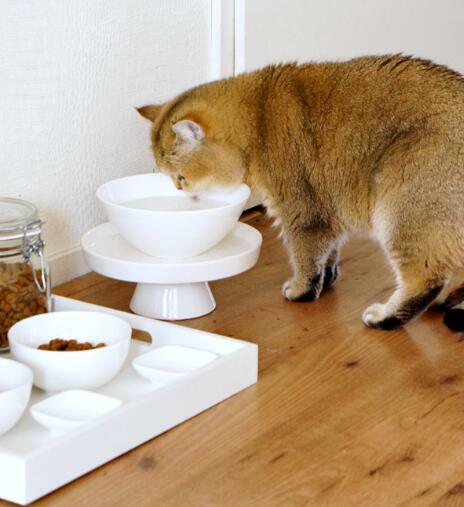 Modern Food Bowls: DIY this clever food bowl stand to keep mess to a minimum. shop the cat bowls here from amazon. The height will hopefully help your pesky kitty from knocking over the water dish. 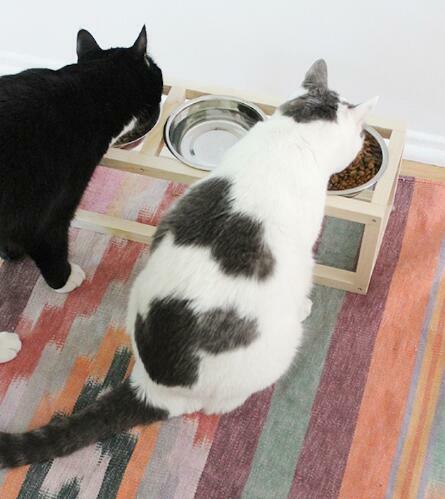 The IKEA Trendig tray table has two convenient, cat-sized baskets. 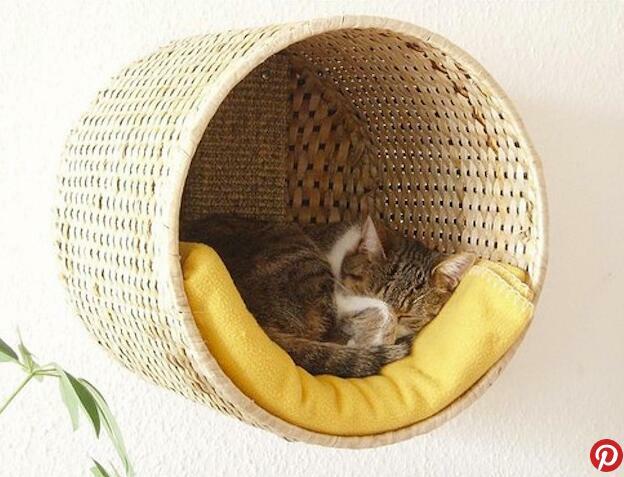 Just by adding some comfortable cushions, Pinterest user Hanna transformed the baskets into perfect little cat beds. 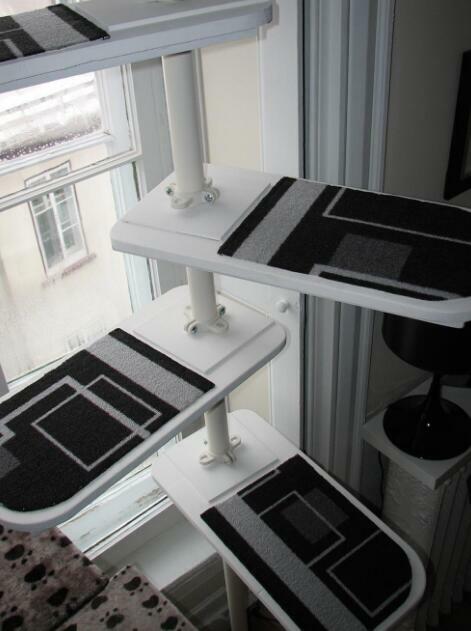 It's basically a special little display stand for cats, which is adorable. 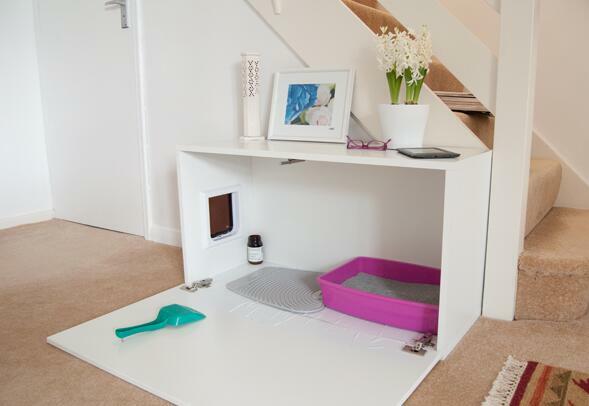 If you’re tired of constantly sweeping up cat food messes, create a cute little tray area for their dishes, food and, most importantly, treats. 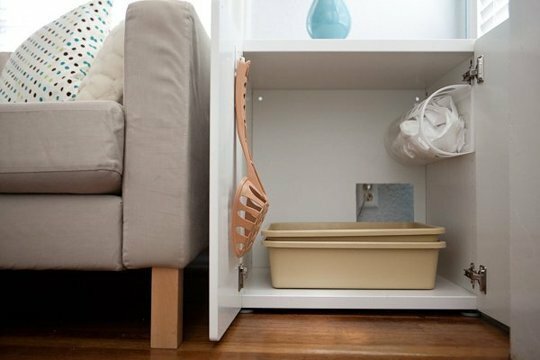 Not only does it look sleek and tidy, but everything is organized and much easier to clean. These three even have their own blankets, with patterns chosen to match their personalities and interests! 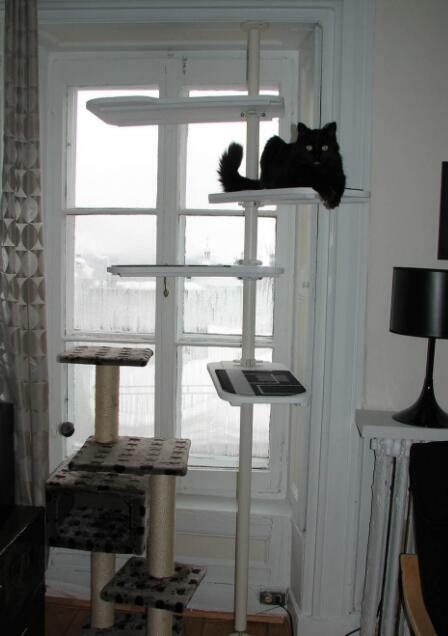 Description: Here is our version of the “Stolmen” cat tree. We were inspired by pictures we saw on this website. We bought the post and fixtures and built our own shelves to reduce the cost. We gave the shelves the shape we wanted and painted them in white. 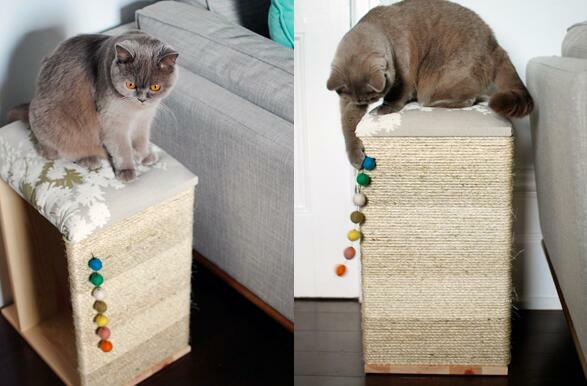 This combination cat bed/scratching post, by The Deviant Housewife, makes use of an EXPEDIT wall shelf. It looks pretty popular. 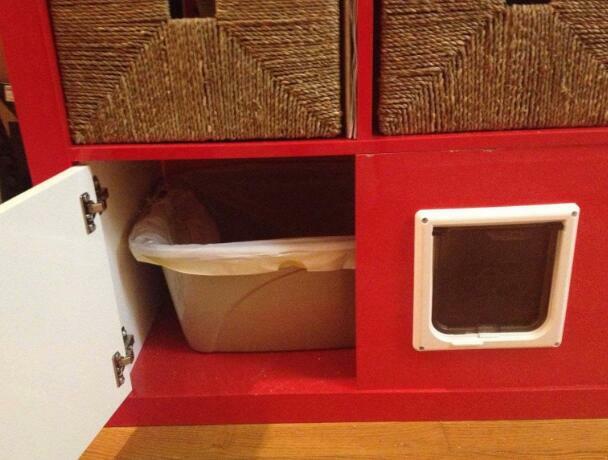 Hiding the litter box is especially problematic in a small apartment. 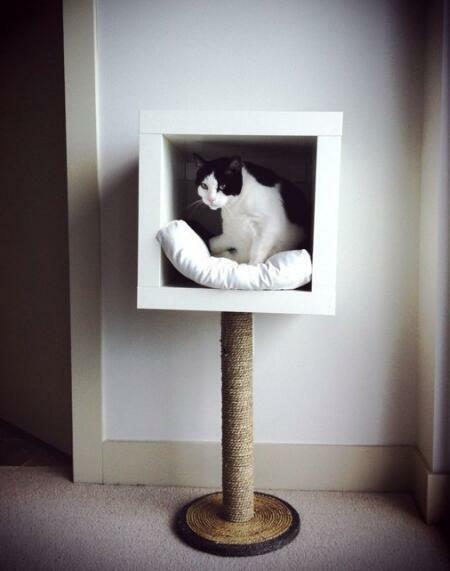 Brandy from Bella Pop came up with a great solution: an IKEA STUVA box, with a hole cut in the back for a kitty entrance. The front opens up so Brandy can scoop, and when the doors are closed the whole thing just looks like an end table. 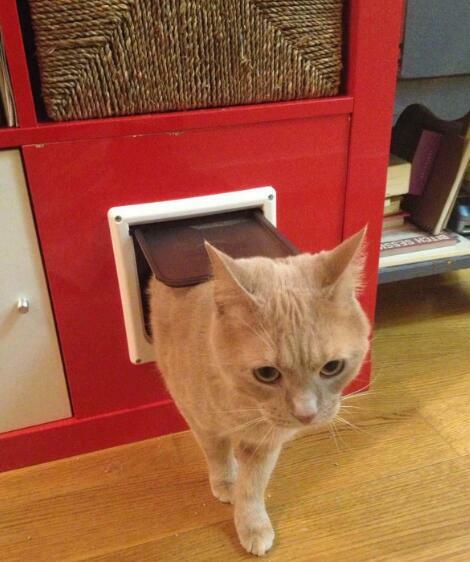 Kitty door cut to size with jigsaw (before installing the back cover!) Don’t have a jigsaw? Find a friend who does! 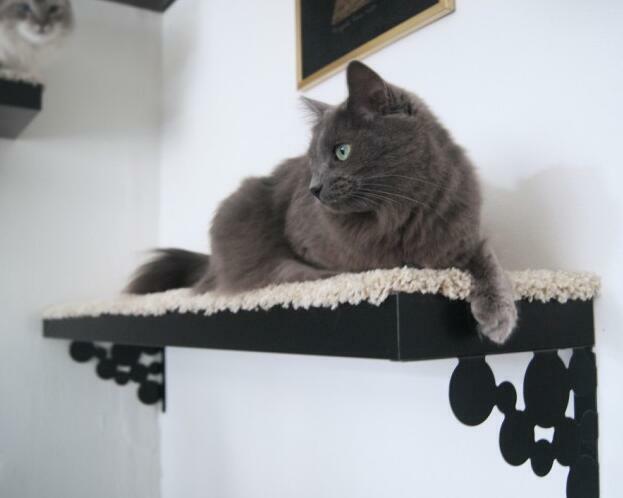 If your kitty is a tree-dweller, they’ll love having their own shelf where they can judge you from above. 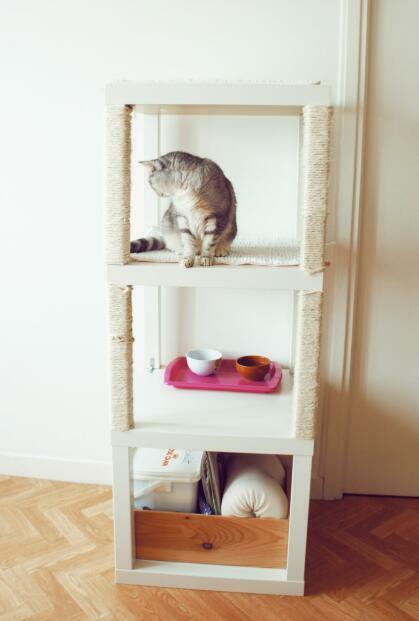 If you don’t have room for (or don’t like the look of) a giant cat tower, just mount some IKEA shelves and add carpet so they don’t slip off. 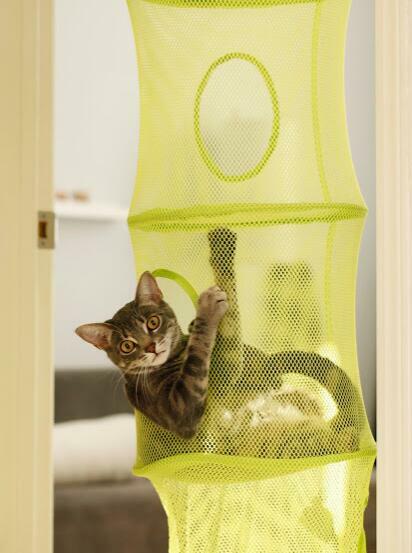 This IKEA hanging storage which is still could be cat's favorite resting spot. 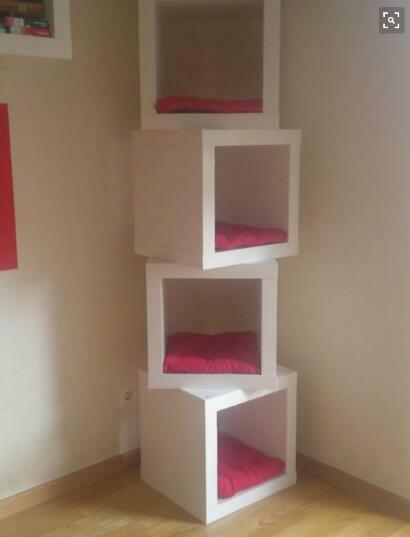 Ikea cubes + chair cushions = awesome cat tower, super great idea! 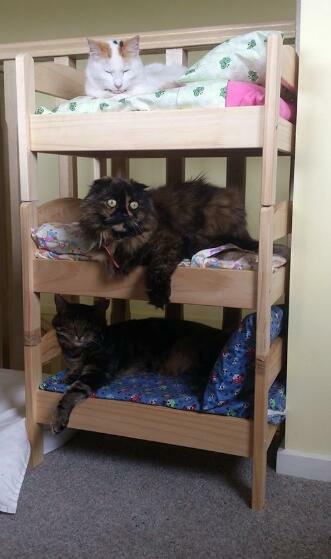 I will have to try this out for my cat! He will love this!